Google’s parent Alphabet has deployed Project Loon and its LTE balloons to Puerto Rico bringing Internet service to the island. In a 20-Oct-2017 blog penned by Project Loon head Alastair Westgarth, the company says it’s working with the Federal Communications Commission, the Federal Aviation Authority, FEMA, and other cellular spectrum and aviation authorities to bring connectivity to parts of the island still suffering in the aftermath of Hurricane Maria. Loon’s official LTE partner for the initiative is AT&T, which is helping Loon use its fleet of stratospheric helium balloons to bring functions like text messaging and minor web browsing access to Puerto Rico residents who have LTE-equipped smartphones. Floods are the most common natural disaster. Some floods develop over a period of several days, but a flash flood can cause raging waters in just a few minutes. Mudflows are another danger triggered by flooding that can bury villages without warning, especially in mountainous regions. Everyone is at risk from floods and flash floods, even in areas that seem harmless in dry weather. Always listen to the radio or TV to hear the latest updates. Some other types of radios are the NOAA Weather Radio and Environment Canada Weatheradio with battery backup and tone-alert feature that alert you when a Watch or Warning has been issued. Learn risks – Ask local emergency management office if your property is a flood-prone or high-risk area and what you can do to reduce risks to your property and home. Find out what official flood warning signals are and what to do when you hear them. Ask if there are dams or levees nearby and if they could be hazards. Learn to shut off – Know where and how to shut off electricity, gas and water at main switches and valves — and ask local utilities for instructions. you can buy federal flood insurance through most major insurance companies and licensed agents?! you do not have to own a home to have flood insurance as long as your community participates in the NFIP?! NFIP offers coverage even in flood-prone areas and offers basement and below ground level coverage?! Put it on film/chip/drive – Either videotape or take pictures of home and personal belongings and store them in a safe place with important papers. Be aware – Listen to local news and watch for flash floods especially if near streams, drainage channels, and areas known to flood. Be prepared to fill and place sandbags in areas as instructed to help combat rising waters. Get to higher ground – If in a low-lying area, move to higher ground. Secure home and move important items to upper floors. Turn off utilities at main switches or valves if instructed by authorities and DO NOT touch electrical equipment if you are wet or standing in water! Fill up your car with fuel. Obey warnings – If road signs, barricades, or cones are placed in areas – DO NOT drive around them! Find another way or you may get fined. downed power lines – extremely dangerous in floods!! Obey warnings – If road signs, barricades, or cones are placed in areas – OBEY THEM! Most areas fine people who ignore posted warnings. DO NOT drive around barricades… find another way to get there! Strange critters – Watch out for snakes and other wildlife in areas that were flooded. Don’t try to care for a wounded critter since it may try to attack you… call your local animal control office or animal shelter. Flooded food – Throw away food that has come into contact with flood waters since eating it can make you sick. Drinking water – Wait for officials to advise when water is safe to drink. If you have a well that gets contaminated, find another source or boil water. Wash your hands – Wash hands often with clean water and soap since flood waters are dirty and full of germs! Use bleach – The best thing to use for cleaning up flooded areas is household bleach since it helps kill germs. Sandbags – If any sandbags come into contact with floodwaters, wear rubber gloves when removing them and follow officials’ instructions on where to discard them since they’re most likely contaminated. Listen – Continue listening to radio or TV for updates on weather and tips on getting assistance for housing, clothing, food, etc. Insurance – Call your insurance agent or representative to discuss claims. Mold – Consider asking a restoration professional to inspect your house for mold and visit www.epa.gov/mold for flood cleanup tips. Above extracted from our book called IT’S A DISASTER! …and what are YOU gonna do about it? America’s PrepareAthon! is a national community-based campaign for action to increase emergency preparedness and resilience through hazard-specific drills, group discussions, and exercises. and participate in community resilience planning. The spring and fall events are designed to encourage Americans to practice preparedness before an emergency or disaster strikes. For example, each year the Great ShakeOut earthquake drills encourage millions of people to physically practice what to do during an earthquake, and America’s PrepareAthon is modeled on the same principle. Participants must commit to take action and take at least one step (or more!) to prepare for a hazard they may face. As mentioned above, the PrepareAthon! will occur twice a year — once in the spring and once in the fall — with the 2014 events planned on April 30 and September 30. Each event will concentrate on specific hazards and themes, but communities, organizations and families are encouraged to use the various resources throughout the year since disasters can happen anywhere and anytime. Agencies, organizations, businesses, schools and individuals can visit www.ready.gov/prepare and register to participate in America’s PrepareAthon! During the signup process organizers would like to know a few details about activities you are planning for the April call to action (similar to registering for ShakeOut events), plus you can join the National Preparedness Community to post events and network with others in the forum. Also America’s PrepareAthon! organizers are providing customizable guides, social media tools and promotional materials for families and groups to use whether you just do the National Day of Action on 4/30 or hold drills or exercises year-round. The key is turning knowing into doing! In addition to the above and below links, consider learning more about FedHealth’s customizable disaster preparedness and first aid manual for your public outreach efforts too. Our IT’S A DISASTER! book qualifies as community education on grants and provides about a $3 or $4-to-$1 return on match since we discount it up to 70% off list (or as low as $4.50 each) and customize it for free. Or download some free preparedness topics from our It’s A Disaster! books … or visit your state or local Emergency Management, Health or Fire or Police or Sheriff department’s website to find local emergency information, safety tips and tools to help you and your loved ones get prepared. And again… learn how to take action and get involved with America’s PrepareAthon at www.ready.gov/prepare and follow them on Twitter @PrepareAthon or Facebook. 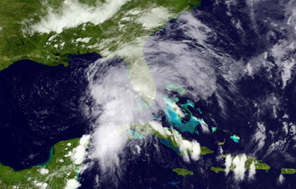 Tropical Storm Andrea, the first tropical storm of the 2013 Atlantic season, has formed in the Gulf of Mexico. A Tropical Storm Warning has been issued for portions of Florida’s Gulf coast with a Tropical Storm Watch along portions of the Southeast U.S. Atlantic coast. According to the National Hurricane Center, the center of Tropical Storm Andrea is forecast to reach the coast of the Florida Big Bend on Thursday afternoon or evening, and then move over southeastern Georgia and eastern South Carolina Thursday night and Friday. 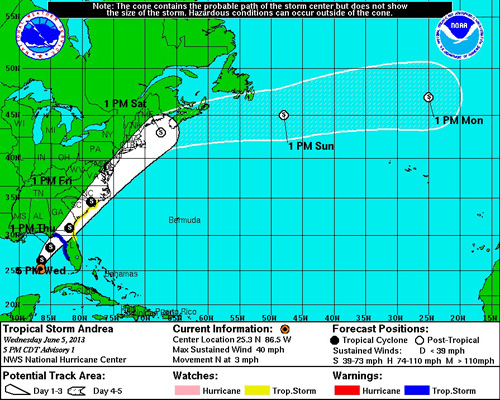 The main concern with Andrea is very heavy rainfall that could lead to flooding.